The old textile mill has a problem. The people who work there keep dying, especially the ones who work the night shift. The mill has another problem. It’s become infested with rats. Just stepping into the mill means you’re running the risk of having a rat fall through the ceiling and land on your head. The evil mill foreman, Warwick (Stephen Macht), puts together a cleanup crew to work overnight and take care of the infestation. Idealistic drifter John Hall (David Andrews) is hired to help and soon discovers that there’s something even bigger than a rat living underneath the mill. Unfortunately, by the time that John makes his discovery, almost everyone else is dead and Warwick, having had an Apocalypse Now-style breakdown, is painting his face with muck and trying to kill whoever’s left. This is a weak film adaptation of a throw-away Stephen King short story. That the film itself is clearly not meant to taken seriously doesn’t make it any better. The only thing that this film has to recommend it is Brad Dourif, who has an extended cameo as a crazy exterminator named Tucker Cleveland. Cleveland knows everything about how rats have been weaponized over the years and he will be more than happy to explain every detail. It’s too bad that Dourif does not have a bigger role because the movie is lot less entertaining when he’s not around. 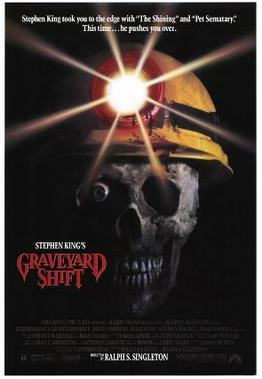 If you do watch Graveyard Shift, stick around for the end credits so you can hear the theme song that is made up of samples of dialogue from the movie. This entry was posted in Film, Film Review, Horror and tagged Andrew Divoff, Brad Dourif, David Andrews, Graveyard Shift, Horror, Horrorthon, Kelly Wolf, Ralph S. Singleton, Stephen King, Stephen Macht. Bookmark the permalink. I kinda liked this movie when I saw it a while back. Rats – yuchhh!